THE CENTER of TRAINING & CONSULTING LLC. One of the main coping strategies of poor households during the transition period is engagement in small scale farming, production and /or petty trade (self-employment). These activities help to smooth household consumption and maintain food security during crisis. Despite considerable efforts, however, most of the poor people engaged in these activities have not been able to overcome poverty. 21% of households who get the majority of income from self-employment activities are very poor and 43% are poor. Also 18% of households who get most of their income from the sale of crops or livestock are very poor and 44% are poor (Holt 1997). The lack of access to affordable and continuous credit and saving facilities, training, extension, inputs and markets have been identified as the major threats to poor people’s ability to overcome poverty. Extended family and neighbourhood support has been exhausted as most people continue to face difficulties. The poor have no access to formal lending institutions due to the high costs (time, money and bureaucratic procedures), collateral requirements and the unwillingness of these institutions to administer credits to the poor. Informal money lenders are too costly, charging up to 30% interest per month (Oliver 1997). (b)	history of non-repayment amongst agricultural poor - discouraging banks from lending to poor farmers. (c)	the time, cost and bureaucratic procedures involved in obtaining formal credit inhibits poor people’s ability to seek and obtain formal credit. They in turn opt for informal money lenders who provide a quicker service but with exorbitant interest rates. (e)	the size of loans and requirements placed on recipients for some projects (e.g. a minimum number of hectares) indicates that loans are not structured to serve the poor or are channelled through farmers’ associations which "at least in Osh and Naryn, appear to be comprised of middle to upper income farmers" (Holt 1997). Various microfinance projects/donors are currently working or plan to work with existing farmers’ associations, which means that they are unlikely to serve poor families. (f)	some local support organisations or NGOs, even within projects aiming to alleviate poverty, purposely exclude the poor in fear of non-repayment or to avoid costly supervision costs. (g)	The poor who live in the remotest areas with no access to basic infrastructure and social services tend to be more vulnerable yet are less of a target for finance institutions. Research conducted in Osh and Jalalabad by Save the Children Fund, UK identifies several objective constraints upon the capacity of rural/remote poor households to engage in income generation. These include: distance from the market, low purchasing power of consumers, the unfavourable terms of trade between pastoral and agricultural and manufactured products (Howell 1996). These conditions tend to preclude microfinance institutions from operating in these areas due to the high costs of delivery. In addition to limited access to credit for the poor, there are also certain loan conditions which fail to meet the real finance needs of the poor. The restriction to productive loans for example means that the finance needs to overcome family crises through consumption loans are not covered. It also precludes poor people from diversifying their activities (to include trade) during seasons in which their normal business activities are not profitable or viable. Based on the fact that poor people are willing to pay very high interest rates to informal money lenders, it has been suggested from experience that high interest rates should not be regarded as a deterrent for loan access and therefore the poor do not require subsidized loans. Only self-sufficient and sustainable systems and institutions can serve the poor effectively. There is a growing realisation that large scale lending of small amonts to the poor can not be accomplished through subsidies or grants. Full Institutional sustainability is achieved when a Microfinance Institution is generating positive (inflation adjusted) returns on assets, covers costs of operation and possesses sound organisational and managerial structures. This status constitutes both financial and managerial/organisational sustainability. Discussions of the potential for sustainability sometimes suggest that a Microfinance Institution can become financially sustainable between 7-8 years after starting operations. Some organizations like ASA (Bangladesh) are, however able to achieve sustainability within 8 months of starting operations. The structure and management of the organisation are equally important considerations. Management of the savings and credit scheme should demonstrate integrity and accountability in dealing with other people’s money. Staff integrity and honesty are crucial to the organisation’s credibility and hence users’ continued demand for services. "Organisational form may be the most significant design element in relation to long-term sustainability. Some NGOs have turned themselves into banks, but this is not likely to be an option for most NGOs" (Johnson and Rogaly 1997). (a)	The need to keep operational costs down and fully covered by income earned. Lending to the poor means dealing with small loans which are costly to administer. The fact that collateral is not used also means that intensive supervision by field workers is needed - further increasing operational costs. The income earned through interest payments is also small in comparison with administrative costs. Scaling up (increasing the number of borrowers) to achieve economies of scale and generate profits is sometimes constrained by the lack of organisational and managerial capacity for expansion in the short and medium term. Low population density in some areas combined with poor infrastructure and communication also increases the costs of delivering services. Most Microfinance organisations or schemes in Kyrgyzstan have opted for clients that are capable of taking larger loans and repayment guarantees (collateral). There have also been tendencies of microfinance schemes in some countries to combine lending to the poor with financial services to the non-poor (to subsidise the poor); opt for more urbanised areas with more favourable infrastructure and limit their activities to finance only, excluding business advice and other services. Full loan recovery is essential for achieving sustainability and also for accountability to donors and the community. The fear by some organisations that the poor will not be able to repay makes them purposely exclude the poor. On the other hand, through very strict lending measures, institutions are able to recover all their loans without taking into account the sustainability of the income generating activities of the poor. Some of the poor are unable to continue their business activities after loan repayment or have to borrow money from other people to repay their loans whilst they continue their business activities. Whilst short loan repayment periods increase turnover and income, they sometimes lead to further indebtedness on the part of the poor. (a)	Character references. These have been used in Kyrgyzstan through the Farmers’ Associations but have not been very successful due to continued default by borrowers. (b)	Locally recruited lending agents with ‘insider information’. (c)	Use of regular repayments instead of lump-sum repayments enable the poor to complete full repayment. (This is, however, inappropriate for agricultural loans). (d)	Savings - both compulsory and voluntary enable microfinance institutions to "screen out some potential defaulters, build up the financial security of individuals, increase funds available for lending and develop among the members a degree of identification with the financial health of the institution" (Johnson and Rogaly, 1997). The goal of the global microcredit summit (held in Washington DC in February 1997) is working to ensure that 100 million of the poorest families, especially the women of those families, are receiving credit for self-employment and other financial and business services by the year 2005. Current debates, however, question the validity of credit for micro enterprise development as a tool for poverty alleviation and elimination among the poorest. The extent to which credit benefits the very poor can be measured according to the characteristics of poverty and the ability for the financial interventions to address these specific elements of poverty. Income Poverty: - low levels of annual income per household, usually determined by an income poverty line set by the government or financing organisation within a specific context. Poverty reduction initiatives therefore focus on raising income levels through credit for small enterprises. Vulnerability: - "Poverty can also be understood as vulnerability to downward fluctuations in income" (Johnson and Rogaly 1997) due to seasonal decline in employment for agricultural workers, unexpected shocks like crop failures, death, illness and natural disasters. The lack of assets (for sale or pawning), business knowledge and experience and access to information further increases vulnerability of the poorest, meaning they are less able to take risks or use credit effectively to increase their income. Indebtedness may increase vulnerability of the very poor, for whom business failure is more likely "to provoke a livelihood crisis than it (is) for borrowers with a more secure asset base" (ibid). (Explaining why microfinance schemes tend to target the better-off poor). Interventions which reduce such vulnerability and protect livelihoods also reduce poverty. Powerlessness: - Powerlessness constrains the poorest for self-help. This results mainly in inequalities within the household (by gender, age) and the community (by socio-economic status - wealth, caste and ethnicity) which in turn affects access to and control of resources, benefits and opportunities. "Defining poverty in terms of power relations implies that assessment of the impact of microfinance interventions should focus on their influence on social relations and the circumstances which reproduce them" (Johnson and Rogaly 1997). The National economic crisis makes those in less powerful positions more vulnerable to changes in income, social infrastructure, etc. Closure of kindergartens and reduced social services for the sick, elderly and disabled has for example increased the burden of poor women (based on the existing gender division of labour). They are less likely to benefit from or seek credit due to lack of time and energy for engagement in economic activities. This situation drives them further into poverty creating a vicious cycle without much hope for improvement. 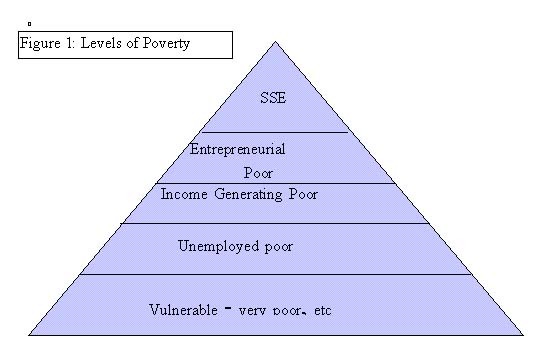 According to Sacay (1997), there are various levels of poverty which require different financial and non-financial interventions (see Figure 1 below). The Vulnerable Poor are those who are unable to engage in any economic activities, for example, elderly, disabled, children, etc. and require social or targeted assistance to meet their most basic needs including food, clothing, shelter, and medical services. The Unemployed Poor are those who are able to work but lack the skills or opportunities for employment. Appropriate interventions may include a combination of: employment schemes (including public works, food for work, seasonal employment, etc. for income); promotion of informal financial services (savings and credit) through self-help groups to help reduce vulnerability, build confidence and skills in financial management with a longer term objective of graduation to microfinance; training (both business and skills) and provision of social services the absence of which hamper their ability to work (e.g. kindergartens and primary health care). They constitute the poorest, with very limited assets and whose needs are often found too varied and costly for microfinance schemes. The Income Generating Poor are those who are engaged in petty trade and home production to generate income for household survival. Business enterprises are often family owned. They earn a little income just to sustain livelihoods. Entrepreneurial Poor are those most favoured by Microfinance Institutions as they have some business experience and possess some assets (which they can use for collateral or sell to overcome crises). "The poor, especially the very poor, will only be reached in microfinance initiatives which adopt concerted strategies to target them directly…or indirectly…. Establishing broad criteria (such as the project should reach single mothers) may not be sufficient to ensure the poor are served nor would setting "group level" loan limits" (Holt 1997). · Housing index method, which selects target areas and beneficiaries based on status of housing (for example, mud houses compared to brick structures). · Putting loan limits and imposing very strict regulations like weekly meetings, regular repayments, etc. This is often easier in urban areas and for petty traders and entrepreneurs. Such indirect targeting in rural areas for agricultural loans would be more difficult as they require larger loans with longer repayment periods, repaid in one lump sum. · Setting eligibility criteria, for example, the landless, those with no assets, etc. · Compulsory attendance at weekly meetings or contribution of physical labour to which wealthier people will not agree. Direct targeting strategies require more time, efforts and community participation and might be found rather costly by some microfinance institutions. Whilst indirect strategies are less costly, they are sometimes inadequate especially in areas where there is no other access to credit. It may be necessary, therefore, to use a combination of both direct and indirect strategies, particularly in the rural areas. (i) Easy access to savings. "From the perspective of poverty reduction, access to reliable, monetized savings facilities can help the poor smooth consumption over periods of cyclical or unexpected crisis, thus greatly improving their economic security. It is only when people have some economic security that access to credit can help them move out of poverty by improving the productivity of their enterprises or creating new sources of livelihood" (Johnson and Rogaly 1997). Savings can also provide collateral to reduce risks of non-payment during difficult times. Savings as an incentive for repayment may increase the clients’ interest in the fiannce institutions and therefore reduce the need for intensive supervision. (iii) Access to more and larger loans upon timely repayment to enable the poor to continue and expand their income generation activities. This is also an incentive for timely repayment. (iv) Building upon existing informal financial systems which are not exploitative of the poor, for example, ROSCAs. (v) Provide a wider and innovative range of financial products based on detailed needs analyses including: hire-then-purchase where poor people are nervous about taking large loans; insurance through simple endowment schemes and group based insurance. (vi) Financial services alone cannot reduce poverty. Linking with other programmes and/or organisations which provide technical assistance and social services to address the complex needs of the poor and the causes of poverty. These may include business and skills training (improving their ability to utilise credit effectively), preventive health programmes (to reduce the need for credit for health care purposes), building capacity for collective action and institution building through social groups to address powerlessness, child care provision, introducing appropriate technologies to reduce workload, save time and fuel, etc. Linking with other programmes reduces the need for the financial services provider to charge very high interest rates or otherwise subsidize credit. (vii) Working directly with policy makers at all levels to create an enabling environment for poverty reduction, for example, introduction of temporary tax holidays, support for insurance contributions, review of bureaucratic procedures for business registration, etc. (i) To make the microcredit system low cost and effective, involve local communities and the beneficiaries in as many tasks as possible. (ii) Encourage local NGOs, Animators, Trainers, etc. as far as possible for economy as well as effectiveness. (iii) Make the procedures relating to savings, credit, recovery, accounting, etc. convenient, simple and operatable by the people themselves. (iv) Appraisal, supervision and recovery of the loan is done by the community and Self-Help Groups members jointly which reduces the high transaction cost if the same is done through NGOs/Formal Financial Institutions (FFIs). (v) Convenience and low transaction cost to the beneficiaries while borrowing and repaying at their door step in a prompt manner leads to greater demand and increased operations which will help in sustainability. (vi) Donors/Government’s Subsidy/grant, being limited, should be used only towards technical assistance - like motivation of and, organisation of groups, capability building of NGOs, local leaders and the beneficiaries, training and extension, common infrastructure, etc. Over a period of time when the operations increases the cost per unit on these components will reduce substantially and can be partly passed on to the FFIs, groups and beneficiaries. (vii) Credit component, right from the beginning, should be disbursed at unsubsidised interest rate. Poor are willing to pay the reasonable interest if timely and continued availability is ensured. However poor borrowers should not be made to bear the cost of inefficiency or unnecessary high overheads of NGOs and FFIs in the name of financial sustainability. (viii) To generate internal resources savings should be made compulsory and increased gradually so that dependence on high cost external funds is reduced. There are micro credit institutions/groups where the savings is much more than their requirements and hence passed on to other groups, micro credit institutions, banks, etc. (ix) Continued availability of funds is necessary for sustaining the interest of the poor beneficiaries and bringing them above the poverty line. Suitable linkages of micro credit institutions with FFIs may help in availability of funds subject, of course, to regular of repayments. (x) NGOs and groups may also be involved in non-credit socio-economic activities for the benefit of the group members and the community as also management of common facilities and resource centres. This will, on the one hand, reduce the marginal cost on credit operations and on the other, help sustaining the long term interest of the groups, community and NGOs in the micro credit programmes. In developing poverty alleviation interventions, the need for detailed proverty analyses within target areas cannot be underrated. A detailed study of household coping strategies (for example that undertaken by Save the Children Fund, UK, in Osh and Jalalabad Oblasts) helps to ensure that poverty reduction initiatives build on existing strategies and capacities. Such studies enable us to ensure that we are providing appropriate interventions - and in many cases, reveal that credit is only one of the many means to poverty reduction, none of which can be effective in isolation. Employing participatory approaches in identifying needs, solutions and designing specific mechanisms for poverty alleviation reduces the risk of programme failure.